To some, caregiving is a juggling act. There are doctor’s appointments, a quest to find the right diagnosis, paperwork (then more paperwork), calling agencies for assistance, keeping supplies and medications adequately stocked and dealing with the declines in our loved one (and that could be all in one day!). Add in all the “regular” life stuff a caregiver is doing (raising a family, working, taking care of personal health) – wow, that’s a lot of balls in the air. For others, caregiving is more of a balancing act. Walking the high wire with no net – yikes! I don’t know how to juggle (something always ends up splattered on the floor – what? You don’t learn with eggs?). I am a klutz and afraid of heights so balancing is out of the question. (I’d be the one splattered on the floor!). 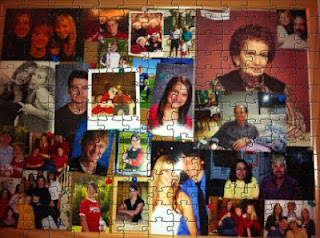 For me, I have to describe caregiving as more like a puzzle. I love puzzles whether they are the crossword kind or the Sudoku kind or the open a box with lots of teeny, tiny pieces kind and am pretty good at solving them. (My friends love to make fun of me for my love of putting together puzzles). My mom loved crosswords and puzzles, too, but was much better at solving them than me. That’s okay – I’m up to the puzzle challenge even though the puzzle never stays the same. It changes. A lot and often (and it’s never one of those easy 100 piece puzzles). This caregiving puzzle has a gazillion pieces. Yesterday, I was trying to accomplish so much that I felt like the puzzle was never going to be solved. I was determined to have Robert stay with us this weekend since next weekend we will be away at the Boot Camp graduation of The Son Formerly Known as Wayward (in a few short days I can start calling him Air Force Son!). I thought it would be too much to ask of Robert to miss two weekends in a row with us. If there ever was a time to do it, though, it would have been this weekend. Add in a few more pieces – several errands to run before getting to visit mother-in-law (involving getting supplies for both her and my husband who has spent the last several days at the hospital with his mom). My call to Robert changing the pick-up time from 11:00 to 3:00 was met with some disappointment but changed to understanding once I explained the situation. Add in a torrential downpour and a terrible miscalculation of my abilities to get to and from and the pick-up time moved to 4:30. By the time I arrived to pick up Robert, he was in the middle of changing because of an accident. He then had to use the bathroom which required assistance with clean up. This puzzle is complicated and messy! An hour later, we left for the 45 minute drive back home and I still had a trip to the store that needed to be accomplished. Another day to throw the start of my “I’m going to be a gourmet cook” plans out the window (any excuse not to cook!). Robert was happy. He ended up with a cheeseburger, fries and a shake. Robert finished eating, I fed the animals and let them all out and off we went to the store. By the time we returned with supplies needed for the animals during our upcoming trip, put everything away, giving Robert a bowl of ice cream (in a moment of weakness/bribery I promised him ice cream if he helped me at the store even though he had already had a shake), Robert was able to watch Jeopardy and I was able to check the mail and read a note from my doctor that my cholesterol was still high and I should “try harder” to diet and exercise. Ugh! I know, I know. Add a piece to the puzzle. The puzzle is getting larger and the pieces are getting smaller: arranging care for the animals while we are away (thank goodness for awesome friends! ), arranging visits for mother-in-law while we are away (her family is more than willing to do so which should give my husband some piece of mind with his own caregiving puzzle) and a reminder to myself to let Robert’s Day Program director and New Home know we will be out of town soon. After a restful night’s sleep surrounded by animals and Robert laughing and joking this morning, happy to just be here for any amount of time, I realized that no matter how big the puzzle gets or how many pieces are in it, the picture my puzzle creates is of a beautiful, loving and happy family. I’ll solve that puzzle any day. It's a good idea for your to compare the work of a care giver from juggling. It is indeed very difficult to do care giving especially if you have your own family to take care of. Balance is indeed the solution to this problem. This is what I learned from the care training courses I've undergone. For as long as you know how to balance your time and work, then care giving and family can go hand in hand. Anne, It's tough to balance but as you pointed out, it can be done. I'm glad you've gained insight and help through your training courses. Goodbye Wayward Son, Hello Airman!